Help for Acid Reflux, Heartburn, GERD, Indigestion, IBS, Gastroparesis, and Many Other Digestive Issues | What I found to help! I am not claiming to cure or diagnose anything! After suffering for years with digestive problems of my own, and then having to watch my babies scream in pain for hours from acid reflux, gas, etc. and not know what to do…. then finally finding life changing answers…. I felt compelled and wanted to share my story with others. I started by having a short article printed in our church magazine and after having over 100 people contact me I decided that digestive problems were much more common than I had thought. So, I started searching the Internet and was startled at how many babies are just as bad and even worse than mine were. I also found it staggering how many adults are suffering severely. But worse than that is how few of these people are getting real help or real answers! I hope and pray that by me sharing my story, I can be a ray of hope and of help to at least a few of these sufferers! On this page I will explain how and why probiotics and digestive enzymes are so beneficial to anyone young or old that has any kind of digestive problems. We use “Digestive Health” sold by Core Health Products. To learn how to find quality probiotic and enzyme supplements go to How to Choose the Right Probiotic/Enzyme Supplement. When my boys were almost one and three years old, they were still both on Prevacid and avoiding all dairy, soy, and some other foods. At this point is when we found that Alkaline Water made a huge difference for them and they were both able to quit taking their Prevacid. They started sleeping through the night much better and had a lot less pain. To learn more go to my Alkaline Water page. A year later, someone suggested we should try adding in a supplement of probiotics and digestive enzymes for our boys. They made a HUGE difference and that was over 2 years ago. Today our children can eat any and all foods!!! To read in detail how my children suffered from reflux and food intolerances, their symptoms, and the process we went through to finally find help, please go to A Detailed Account of What All We Went Through with Our Children. Before a baby is born, their digestive tract is sterile- meaning it is free from bacteria. The baby will pick up it’s first “dose” of good live bacteria (also known as probiotics or gut flora) from the birth canal. Whatever kind of probiotics mom has in there is what the baby will get. The next “dose” which is the highest strongest dose a baby will ever get, is from colostrum. Probiotics play a huge role in the health of the baby. They make up over 70% of the immune system and they are what line, coat, and protect the entire digestive tract. Here is a link to an extremely interesting article I found about a mother curing her son’s autism. There are several paragraphs in there that explain about mother’s probiotics and how it affects her children. Antibiotics kill not only bad bacteria but the good also. If a mother has been on many different antibiotics throughout her life it can alter her probiotics. This in turn will alter what kind the baby gets. If the mother has been on antibiotics while pregnant, for sure close to or at the time of giving birth this can severely alter the probiotics that baby gets. In fact, if on antibiotics at the time of birth, the mother may have no probiotics to pass on to her baby. And of course if baby has antibiotics at any given time it will kill off the probiotics. If the mother takes them while nursing, she will pass them on to her baby and it also will kill his/her probiotics. If a baby is born by c-section, this can make him/her be behind in building up the probiotics. But if he/she gets plenty of colostrum it will certainly help. You can go to C-section, Breastfeeding, Antibiotics During Labor or while nursing, and How it Affects Baby to learn more about probiotics. 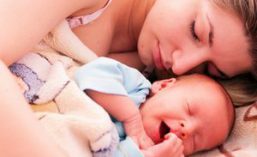 Some babies who are born by c-section, are on antibiotics, get no colostrum, or all of the above, are not necessarily doomed for digestive problems. Some babies are really strong and healthy and their body has no problems making and building up its own probiotics. But for some, this can be the start to the digestive system not working well. Most babies will greatly benefit from a probiotic supplement. When someone is low on probiotics, they are low on many, so the best supplement would be one that has at least 10 different strains in it. But the bottom line is that your child gets relief. Many children with digestive problems can have a lack of sufficient digestive enzymes. Digestive enzymes are what are in all foods (before they are cooked or processed) to aid in breaking them down. They are especially needed for breaking down proteins. If a nursing mom eats a diet of mostly raw foods this can help some but unless the foods are organically grown, they are not very enzyme rich. The pancreas is what makes digestive enzymes and it will try to compensate for the lack of them in foods, but for some babies it can be difficult for their pancreas to keep up making enough to break down the food (proteins in particular) that they take in whether it be through breast milk, formula, or solids as they get older. It is possible for a baby to inherit the problem of their pancreas not being capable of producing enough digestive enzymes, and for these children, they may carry this problem all of their life. Just like the diabetic doesn’t make enough insulin. When “food” is placed in the stomach, the stomach will excrete a small amount of acid to activate the enzymes so they will start breaking down the food. If there are no or little enzymes, then the stomach will excrete a little more acid. Eventually the food is forced into the intestines even if it isn’t fully properly broken down. If the food isn’t broken down then it will very difficult for the body to be able to absorb and use it. For some children, this undigested food will sit in the intestines too long and the longer “food” stays in the intestines, the more moisture that is drawn out of it, and it can cause constipation. This excess acid that the stomach makes, can play a major part in some babies digestive problems. Too much acid will kill probiotics. And beings that probiotics are the protective coating for the entire digestive tract, then without it, the food, reflux, or stool will rub right up next to the esophagus and intestines themselves and can cause them to become raw, inflamed, and even bleed sometimes. So, how have digestive enzymes and probiotics affected my children? Well, they have made a HUGE difference. Cure? No. They have been taking a supplement of them for 2 years and today they are able to eat any and all foods. But they have to take a pill with every meal and any snack that does not have enzymes in it. I still try not to let my boys a lot of dairy though. But if the ask for a glass of milk I normally let them. They were not used to drinking milk when they were younger so it is not something they like terribly well. One evening awhile ago, when I let them have a glass of milk, I reminded them to take a pill with it. I put them to bed, read them stories, then sat in there for a few minutes with them. After Quinton fell asleep, I noticed how restless he was. Soon he sat fully up he was so uncomfortable but he didn’t wake up. This reminded me so much of how he used to be and I got to thinking that he had probably not taken a pill. So I went and got 2 of them with a glass of water and woke him up and made him take them. I was impressed how in about a minute he completely settled down and peacefully slept the rest of the night. And how have probiotics and digestive enzymes helped me? Well, a little TMI but I used to be constipated and suffer from hemorrhoids pretty much all the time. After about 3 months of taking the supplement I realized that I was “going” every day and also my hemorrhoids were much better! Eventually they disappeared and have only returned once for a short while after I had my baby. As for constipation it pretty much stays at bay unless I get careless in taking the pills. I have also been very pleased at how seldom I get bloated and rarely have stomach aches like I used to so often. A cure all? Again, no. But VERY beneficial!! There are many different brands and companies out there that sell probiotic and enzyme supplements. We use a product called “Digestive Health” sold by Core Health Products. It contains 13 different strains of pH stabilized probiotics, prebiotics (which are food for the probiotics), over 20 types of broad spectrum plant based digestive enzymes, and several different types of soothing herbs. I personally recommend using Digestive Health because I know that is what has worked for me and many others, but if you wish to look for a different brand then go to How to Choose the Right Probiotic/Enzyme Supplements. If you decide to try probiotics and/or enzymes, be aware that it can possibly make symptoms worsen for a day or two. This is called Herxheimer Reaction. To learn more go to Side Effects of Probiotics and Enzymes. To learn about probiotic and enzyme dosage go to Pill Dosage. On this page there are also tips on how to get your child to take these pills/powder. Feel free to contact with me with any questions or comments you would have!